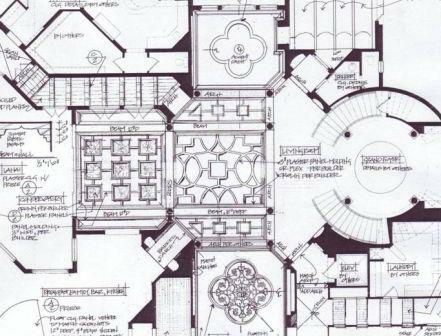 Interior architectural detailing and stone design: Susan P. Berry, Classical Home Design, Inc.
All ceiling details, library cabinetry, all custom fireplaces, side courtyards, all wrought iron, wine room, theater, all game room and game bar details and kitchen space planning. The theme of Cinque Terra was old Cuba mixed with modern colors and details. The home was on a specific budget, and some details were adjusted towards the end to stay on target. During the grand opening, this home had a dramatic effect on the 20,000 plus people who walked through. They either loved it or didn’t understand it. I hope that you enjoy the photos courtesy of the builder and architect. 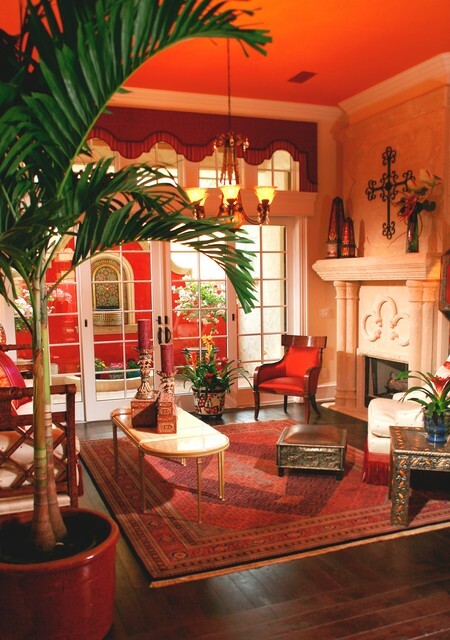 At Classical Home Design, Inc. we are experts at maximizing budgets. Often mid-construction, clients find that they are spending more than anticipated and we often adjust details on the fly, to still present an elegant home. As designers, we are our Clients ally in controlling costs. For example, on one 10,000 square foot home, we made all of the tile and stone selections. The bid came in over $500,000 for all of the countertops and flooring. By reviewing the bid and making some adjustments, Susan P. Berry, ASID cut over $180,000 from the bid without compromising the design. Cinque Terre was a project where cost reductions were made during construction to stay within a fixed budget. Site conditions caused some unexpected cost overruns that needed to be balanced in other areas. 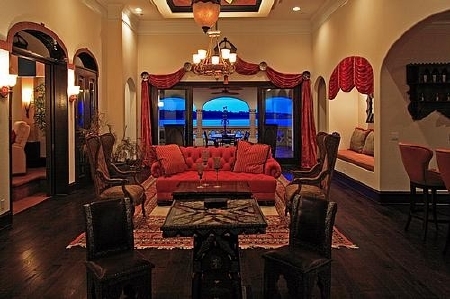 Although the real Cinque Terre is five villages on the Italian Riviera, elements of this dream home reflects five different design themes including, Tuscany, Cuba, Morocco, Mexico and South America. The development, Bella Collina required a Tuscan theme. The ceiling details at the 2nd level game room were replaced with paint. 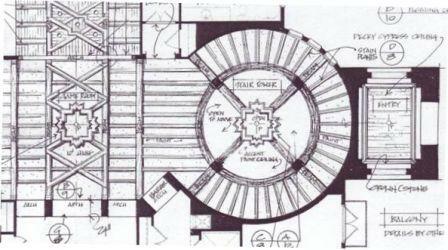 The three arches with the wooden surround open to the theater and the plaster arches open to a built-in seat and bar. You can see from the ceiling sketches below, that intricate wood beamed ceilings were based on original Cuban designs. Originally those ceilings were designed as continuous barrel vaults. The theme in the game room was Old Cuba. 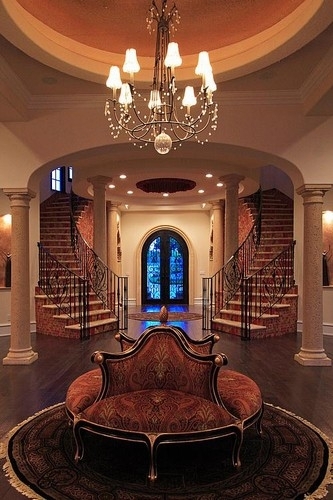 The sitting room features one of Classical Home design, Incs. original stone fireplaces. We also added the sculpted fountain wall to create an exterior court and view. You can see in the aerial photo how close the house is to its neighbor. 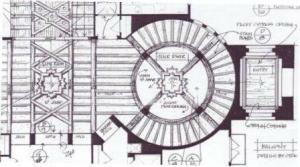 The original home design had an elevator to take guests to the wine cellar basement or the second floor. A three-floor elevator costs around $25,000. We often pre-plan elevators for homeowners who choose to add them later. An easy to remove wooden floor and wooden ceiling were built in the elevator shaft to create this small wine display room. 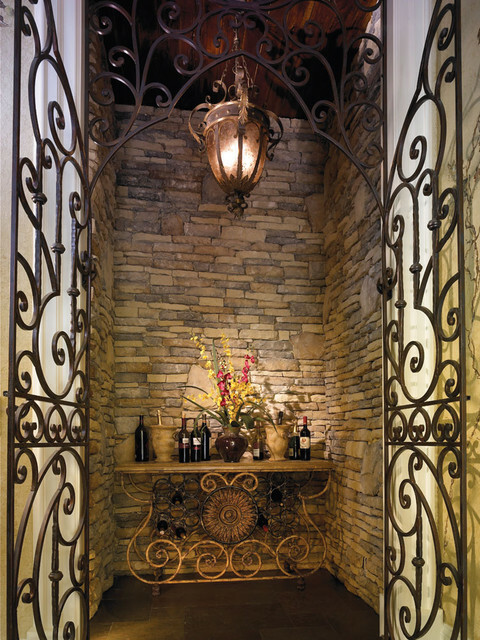 Lower cost cultured stone veneer adds a Tuscan feel to the walls. Classical Home Design, Inc. designed a custom wrought iron gate to fill in the opening. If I hadn’t told you, would you have known that this was an elevator shaft? Tile can be costly. The Master Bath was simplified by using interesting cut-out shapes in the shower wall, eliminating glass shower doors, eliminating marble slabs and using simple low-cost standard size travertine tile. 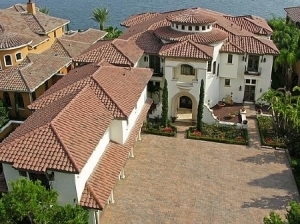 Instead of adding color and pattern in the tile details, which is often done in luxury mansions, color and pattern were reserved for the paint details. 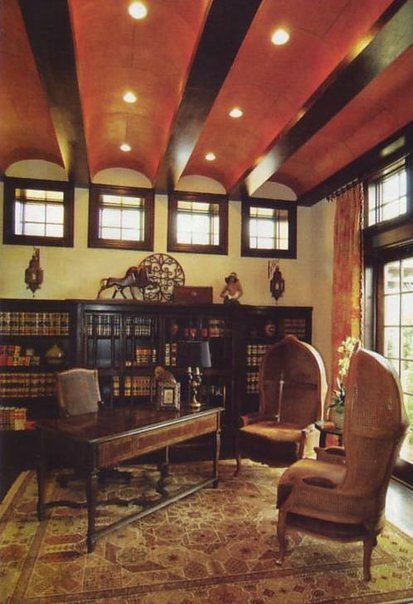 A colorful modern art inspired painted ceiling saves significant cost over built ceiling details. With paint, the possibilities are endless. 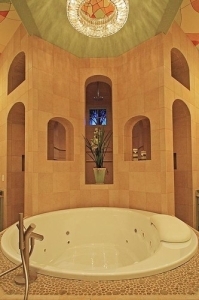 Luxury items like a large round jetted tub and multiple shower heads remain. Since plumbing fixtures span a range of prices, often a fixture that looks luxurious might have a modest price. Luxury is often in size and open space versus orate cabinetry. Instead of using a large marble slab for the tub deck, using simple pebble mosaics reduced the deck cost by close to 70%. 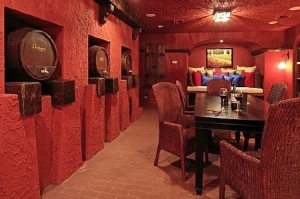 The Wine Cellar basement is another area where bright color created a high impact at a lower cost. Since the home was a speculative house for sale, the decision was made to both cut cost and give the buyer the flexibility to add the details of his choice. Wine collecting is a very personal hobby. The future owner might choose to add a temperature control system for the entire room. 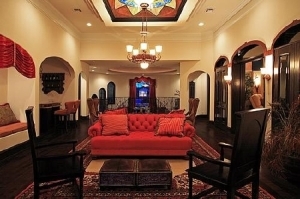 Did you notice the terracotta flooring? The two sketches are my original designs for the room. I designed the barrel fronts in the photo. They open to dispense box wine or hold kegs. The bright colors are reflective of the Cuban culture. Would you like a Modern Cuban Mansion of your own? Whatever your budget, we are experts at adjusting design choices for maximum impact. 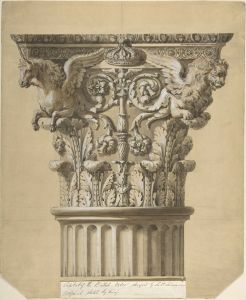 Please contact Classical Home Design, Inc. by email. For faster service, call or text Susan at 407-310-3663.